SALT LAKE CITY (March 23, 2015) - It's better at the ballpark especially with a 2015 Salt Lake Bees promotional schedule that features 10 postgame fireworks shows, more than a dozen premium giveaways and plenty of theme nights to entertain fans. The home schedule at Smith's Ballpark begins on Friday, April 17 with postgame fireworks and a magnetic schedule giveaway for opening night. Fireworks will also light up the sky following games on May 9, May 22, May 23, June 13, July 4, July 24, July 25, Aug. 8 and Aug. 21. Premium giveaways will be featured at nearly every homestand, including a Matt Shoemaker Beard Beanie (April 24), Bees Socks (May 8), Kole Calhoun Bobblehead (June 6), Smith's Ballpark Replica (July 18) and Bees Bank (Aug. 15). Community and theme nights this year include Teacher Appreciation Night (May 5), Pack the Park Pink (May 9), Prevention Dimension Kids Day (May 11), Military Appreciation Night (May 23), Bee Healthy Week (June 11-13), Back to the Future Movie Night (July 17), Salt Lake Gulls Throwback Night (Aug. 1), Daddy-Daughter Date Night (Aug. 8) and Superhero Night (Aug. 22). 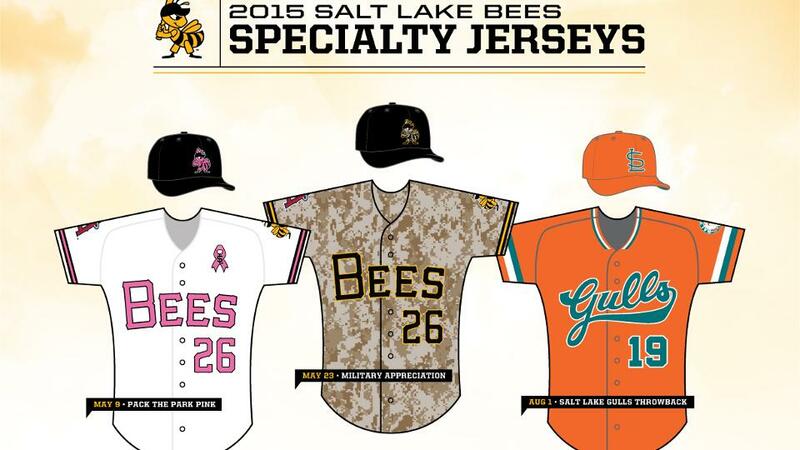 The Bees will wear alternate jerseys for Pack the Park Pink, Military Appreciation and Gulls Throwback Nights. All season-long promotions from 2014 will return in 2015. Monday nights are Smith's Family Night where fans can purchase four tickets and four hot dogs for $20 at Smith's; kids 12 and under eat free on Kellogg's Kids Eat Free Tuesday; Wednesday nights are Wienerschnitzel $1 hot dogs; drinks are $2.75 on Thirsty Thursday; and kids 12 and under can run the bases on Friday and Saturday night with the SNAP Postgame Kid's Run. A full 2015 promotional schedule is available online, complete with additional details at www.slbees.com. Season tickets and group packages are available now by calling (801) 325-BEES (2337). Bees single game tickets go on sale on April 3.